So, Uh, What's Going On With the Sahara Desert? Stretching 3.5 million square miles across northern Africa, the vast sand dunes and rocky plateaus of the Sahara cover more ground than the continental United States. Now, a pair of scientists is making a provocative claim that the world’s largest desert has expanded 10 percent since the early 20th century, effectively adding another Texas-sized chunk. It sounds bad! But some outside experts contacted by Earther expressed serious doubts about study’s findings, suggesting more research on the Sahara, and better data collection across northern Africa, are sorely needed. To track changes to the Sahara’s boundaries over time, the University of Maryland researchers used a global precipitation dataset that includes a network of rainfall gauges across Africa. 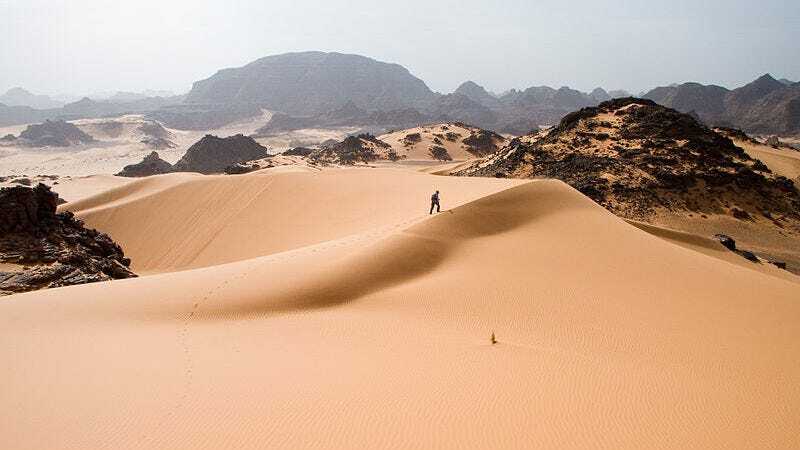 Defining desert conditions as about four inches or less of rainfall per year, they found that from 1920 to 2013, the Sahara expanded by about 270,000 square miles. According to their paper published Thursday in the Journal of Climate, a combination of the Atlantic Multidecadal Oscilllation (AMO), a shift from warmer to cooler waters over the North Atlantic that occurs every 50 to 80 years, and human-caused climate change, are the most likely culprits. Since the late 1990s, when the AMO shifted back into a warm phase, the Sahel has featured a warmer, wetter climate overall, according to NASA’s Earth Observatory. But the study also concluded that climate change is probably responsible for some amount of the regional dry-out—and climate change, of course, isn’t going away anytime soon. This is alarming, seeing as the tens of millions of subsistence farmers living in the Sahel depend on a reliable rainy season to water their crops. Recent drought years have led to widespread famines affecting millions. He also didn’t think the researchers should have estimated desert expansion over time with a linear trendline. “There is no reason whatsoever to expect a linear trend and I am suspicious of any such result,” Trenberth said, pointing to his own research “highlighting the highly nonlinear changes” in rainfall over Africa. Penn State climate scientist Michael Mann, who also wasn’t involved, told Earther in an email that a statistical procedure the authors used to define the AMO is “fatally flawed,” and “undermines ANY conclusions in the study about the role of the AMO.” Nigam firmly disputed this claim. “This study is important because it adds to the body of research” looking at phenomena that are meaningful to people, “which is at the cutting edge of climate science today,” she said.